Every kitchen has some leftover ingredients that are no longer fresh and it is believed that they can’t be re-used. One of the most common thrown-away ingredient is ‘Bread’. Brown, white, multi-grain, sweet or garlic; a bread in all its form is a magical ingredient that sometimes loses its charm and is bound to find its way to the dustbin. However, it’s time to make the best use of bread and zest up the not-so-interesting ingredient. A number of traditional recipes can be tweaked and twisted to create some of the most lip-smacking and gourmet delights using the yesterday’s pieces of bread. These fusion delights will surely impress everyone with your culinary imagination and make you a famous “Master Chef” of your family. 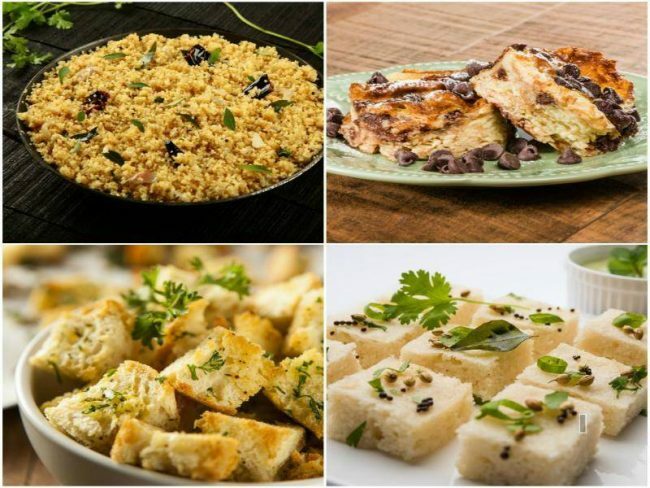 So here are 10 unique recipes that glorify leftover bread in a gourmet way! One of the most popular recipe of southern India – Upma , when fused with the leftover bread slices, it makes for a delicious and wholesome bread delicacy. All you need is a few crumbled bread slices, spices, sauces of your choice, and you are good to go! Try this out for your next breakfast or brunch and watch it become a favorite among your loved ones. If you want to satisfy your sweet tooth and make judicious use of the remaining slices of bread, then Double Ka Meetha can be the ultimate nirvana for you! The taste of bread slices, fried to perfection and dipped in saffron and rose flavored milk, topped up with a generous layer of dry fruits, makes for an ambrosial dessert that feels like an explosion of sweetness in the mouth. Go ahead and try this award-winning delight and we are sure your family will be super impressed! Easy-to-prepare and quite healthy, Bread Dhokla twists the traditional Gujarati recipe by using bread as a base and makes it into a soft and succulent dish that can be the star of the tea time. Basically, it’s a delicious way to cheat on the regular dhokla and make it even more interesting by frying the bread and topping it up with wholesome spices. Enjoy it with a dip of your choice and devour your taste buds in its softness! A savory soup or a fresh salad is incomplete without a crunchy element in it. These Croutons , made with last night’s crumbled pieces of bread are the flavorful crispy ingredient that would lift any dish up with its flaky and crumbly texture. So, if any time some unexpected guests turn up at your doorstep, top up their soup with croutons and we are sure they would love every bit of these! A little chocolate never hurts anyone and when this chocolate is combined with the last remains of the bread loaf, it pushes the traditional European dessert up by a notch and what you have isChocolate Bread Pudding . A favorite among the kids, this Continental recipe is loaded with luscious cream and milk, fused with cocoa and is steamed to perfection. So don’t hold on and indulge in this heavenly delight! Thinking of preparing a flavorful side dish made with bread? Put the leftover crumbled bread to a delicious use by blending it with curd and a mélange of spices and what you have is Bread Raita . A refreshing and luscious side dish, Bread Raita is quite a delectable side to go with a crunchy naan or a crispy paratha and will make every ask for more! Did you know that your favorite poha can even be made using last night’s bread? If you are tired of eating the same old puffed rice poha, then this Bread Poha will be quite a tasty and healthy variation for you. This mouth-watering delicacy tantalizes your taste buds and leaves you craving for more. So, the next time you have some leftover bread, don’t fret and try this yummy delight to enjoy! Ever heard of a chaat that combines leftover bread slice with crispy and zest chaat mix? ThisBread Papdi Chaat is quite a novel idea that adds zing to an otherwise ordinary bread slice. Crunchy bread, topped up with sev and papdi coated in tamarind chutney and yogurt, makes for a mouth-watering snack that is capable of becoming your favorite. All the spice lovers, watch out for last remaining slices of the wholesome loaf and push it up by a notch in the form of this amazing dish! A South Indian delicacy, Idli , when twisted and tweaked with bread, transforms into a healthy snack that can make anyone ditch the junk. Easy-to-make and quite sumptuous, this yummy delight can also be a refreshing change from the regular breakfast meals and can be the perfect way to satisfy the early morning hunger pangs. Halwa is a favorite dessert in every Indian household and does not need a special occasion to be relished. However, if last night’s bread crumbles are bothering you too much, then go ahead and toss them with some sugar, milk along with some ghee and you will get a lip-smacking Bread Halwa . Make it even richer by topping it up with some crunchy and crispy dry fruits, and watch your loved ones go for a round two!